Since I haven’t quite decided on a suitable term to adequately capture how I feel, I will settle for one that conveys the most predominant feeling right now. It is with humility that I embrace this time of my life, to reconnect with the world, and make a deliberate and significant stride toward normalcy since the recent passing of my father. As one who prides herself on being a perpetual student of life’s lessons, I must acknowledge a major loss such as this, as one which I have also viewed within the context of the psyche of Family Adult Caregivers around the world. I share your loss and feel your pain, even as I ‘hear’ my Papa urging me to keep the ball rolling, and to never lose sight of my goal! The drive to keep going should never leave us! I, not unlike a host of other adult children of the recently departed, have a lot to be thankful for when I take stock of the rich legacy my father left behind, not just for me, but for many others around the world. I feel ever so blessed! With the support of my Board, Program Director, Volunteers and Well-Wishers; I am looking forward to the upcoming Your Time For Community Networking Soiree – an opportunity for Long Island’s high school students, as well as current college-bound high school graduates, to experience an intergenerational professional and social relationship with a diverse pool of male and female community role models representing the arts, business & and professional world, academia, human services and local politics. All Participants can look forward to interacting with an impressive line-up of motivational presenters and Resource Persons which includes current college students, professors, medical doctors, community activists and faith based leaders, mental health practitioners, and public officials – all of whom care about the well-being and academic success of our youth. Other highlights include: lunch, entertainment, high tea, beauty and heath activities, giveaways and more! If you have a burning desire to touch the lives of our youth in a special way, and would like to be a part of this initiative, kindly contact us. Please note that our Creative Arts Contest is currently underway with more opportunities for five students to win scholarships ranging from $500.00 – $1000.00. 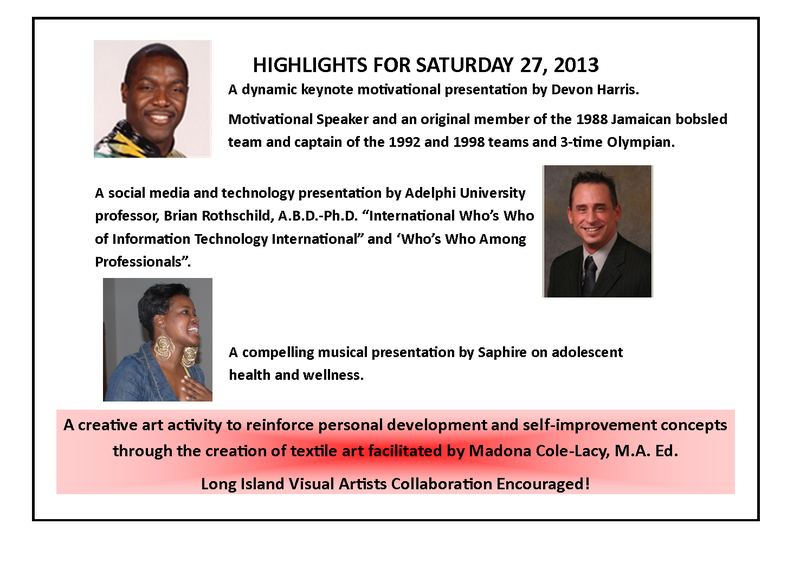 students will take place on Saturday, April 27, 2013 from 8 :30 A.M to 2:30 P.M.
at Molloy College, Kellenberg Building, 1000 Hempstead Avenue, Rockville Centre. Pre-registration is necessary. More information can be obtained at www.yourtime4liny.org. I saw their flicker of anticipation. I saw their shadows fade. They spoke of the “who” they could become. They focused on self, their awakening. That yes, there were gifts sealed within. If you are reading this post, I have no doubt that you are one with a “lifting the world upward and onward” mindset. How do you see yourself contributing to the success of our initiative to empower our youth and parents? Perhaps you are effective at reaching out to the core group who will benefit from this event. You might even possess exceptional persuasive skills you could put into action to convince a child or grandchild of the benefits they will reap by participating in our FREE student-led and caring experts-guided, Self-Empowering Workshop. You might know or be the parent of a scholarly high school or college student whose involvement will be priceless to their peers. You might have some innovative thoughts that are geared towards addressing the needs of the student population in your community that we invite you to share with us. You might be one, or have a direct line of communication with the “movers and shakers” of Long Island and beyond. 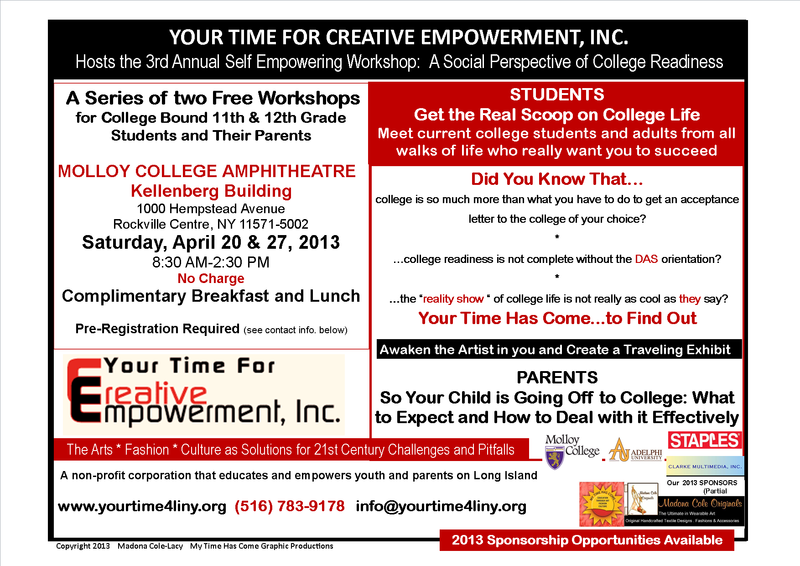 It is your time to join Your Time For Creative Empowerment, Inc., and play a role in the crucial Social Aspect of College Prep.